Don't listen to the naysayers. The zombie apocalypse is real—and imminent. Fortunately, Tiger Log Cabins is on your side with a state-of-the-art, high-tech Zombie Fortification Cabin. Because those goddamn trick-or-treaters zombies never stood a chance. 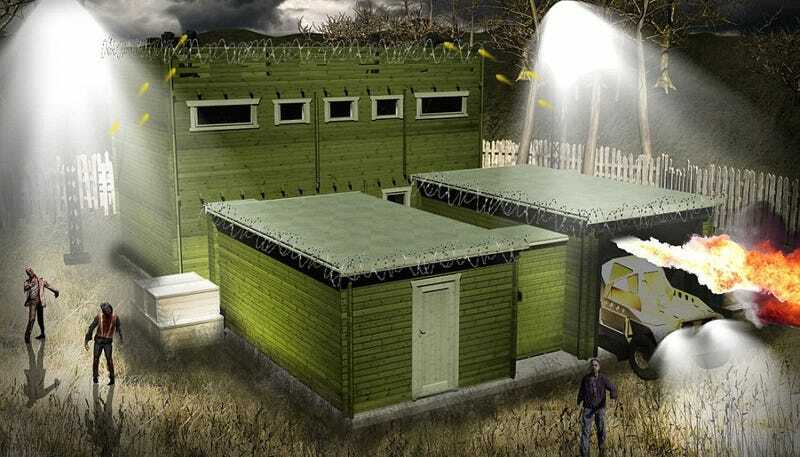 The fortified cabin—which can be all yours for the low, one-time cost of $113,223 (or $146,000 if you spring for installation, cameras, solar panels, and riot gear)—includes everything you could ever possibly need to fend off those vicious, candy-grubbing brain-eating monsters—and a lot of stuff you almost definitely won't need. The 'Winchester' of Log Cabins. In my time I've had little respect as an electronics shop employee, with no real direction in life. But when I bought this Zombie proof log cabin I became the envy of all my neighbours! It's big enough for me as well as my girlfriend and rather vulgar unemployed best friend (who could quite easily be mistaken for a zombie!). With this, any potential zombie apocalypse which could overwhelm the town, I'll have a nice cup of tea and wait for it all to blow over. I officially HATE this zombie proof log cabin!! Having roamed our way through the land mines, in just about one piece, a cluster of us avoided the flamethrowers and made it to the walls. No matter what we tried (eating through the walls, climbing to the roof etc) we just couldn't break in. Unfortunately, as time wore on it became obvious this was a lost cause and some 28 days later we gave up. I have been forced therefore to rate this product 1 out of 5 - to clear up any confusion this is NOT suitable for zombies!! !